This Quoizel Marine 1 light IP44 large outdoor wall lantern in western bronze finish features a nautical flair, with its open cage lantern and seeded storm glass. With a curved edge rectangular wall mount finished in western bronze and straight arm supporting a downward facing open cage lantern. A feature filament lamp is attached to the top gallery and surrounded by a clear seeded glass storm shade. Inspired by vintage Americana, the Marine outdoor collection features a nautical flair. The western bronze finish complements the overall design of this series and the industrial filament bulb accents the clear seedy glass for a classic look. The fitting is supplied with a vintage Edison light bulb as shown in the image. Additional lamp bulbs can be purchased by following this link. Rated IP44 and fully weatherproof, this large outdoor wall lantern is supplied with a manufacturers 3 year anti corrosion guarantee. This covers any corrosion of the finish applied to cast aluminium fittings such as this one. This excludes any locations within 5 miles of the coast. 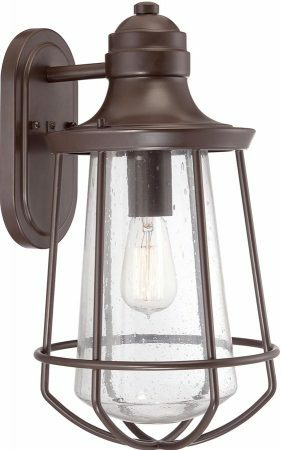 The Marine 1 light IP44 large outdoor wall lantern in western bronze finish and nautical flair is designed by Quoizel, founded in 1930 in New York. They relocated to Charleston in 1996 where they remain to this day. They remain a privately held, family-owned and operated business. Quoizel products are now being introduced to the UK market and have quickly built a reputation for their diverse, unique and fresh designs.